Small hydropower has been found to have a positive effect on the quality of life of rural dwellers in numerous ways. It provides a wide range of services, such as improved lighting; energy for small industries, schools, computer and communication service centers, clinics, and entertainment centers; and operations of a range of domestic and light industrial appliances. Nigeria has many dams built for irrigation and water supply, but these may still have the potential for other uses. One such dam is the Doma dam in north central Nigeria. The dam has a live storage of 30 Mm3 and a yearly average inflow of 114 Mm3. This study is a hydrological investigation concerning the possibility of using the dam for power generation. An artificial neural network model, as automated in ALYUDA Forecaster XL, was used to extend the available streamflow record at the dam site. Thereafter, a reservoir yield–capacity analysis was carried out by maximizing the unknown releases subject to storage capacity constraints. The sequent peak algorithm was used to establish the real storage needed to meet the primary demands, including ecological releases and evaporation losses. The results showed that the maximum monthly yield from the reservoir is 6.56 Mm3, while the storage required to satisfy the dam’s primary functions is 12.07 Mm3. This means that there is 16.93 Mm3 of monthly excess stored water, or 6.53 m3/s, which can be used for other purposes, such as electricity generation. Considering 50%, 75%, and 100% usage of the excess stored water with a head of 20 m, the power potentials were found to be 0.51 MW, 0.77 MW, and 1.03 MW, respectively. It is expected that providing 2×500 kW Kaplan turbines to operate for 12 hours a day will deliver between 2.0 and 4.0 GWh of energy yearly to the immediate communities in the Doma local government area. The objective of this study is to evaluate the reservoir yield and hydropower potential of a multipurpose dam in north central Nigeria to improve power generation in the country through small-scale hydropower plants. It is estimated that only about 10% of rural dwellers and 40% of urban families have access to electricity, and they experience power supply shortages over 60% of the time (Kennedy-Darling et al., 2008; National Bureau of Statistics NBS, 2010). Due to the unstable power supply, many people rely on generators, making Nigeria the largest purchaser of standby electricity generators in the world (Braimoh & Okedeyi, 2010). Currently, Nigeria’s electricity generation capacity is 8,000 MW, while the actual generation is less than 3,000 MW due to an inadequate supply of gas to the power plants (BusinessDay, 2016). This is far short of the estimated long-term power demand of 25 GW required to sustain economic growth and development (Adejumobi & Adebisi, 2011). The Nigerian National Committee of the World Energy Council has estimated that, for the Nigerian economy to grow at a rate of 10%, the country’s electricity requirement must reach 30,000 MW by 2020 and 78,000 MW by 2030 (BusinessDay, 2016). Presently, Nigeria has 16 power-generating plants, out of which, 3 are hydro and 13 are thermal. Nigeria has considerable potential hydro resources, exemplified by the large rivers, small rivers, and streams distributed all over the country (Okoro, 2006). Hydropower currently accounts for about 32% of the total installed commercial electric power capacity of 11,000 MW (Zarma, 2006). For many years, the hydroelectricity supply in Nigeria has come from the Kanji, Jebba, and Shiroro dams, which have capacities of 760 MW, 578.4 MW, and 600 MW, respectively (Sambo et al., 2009). Utilizing the hydropower potentials of the rivers in Nigeria will not only meet the country’s increasing energy demand, but also accelerate the development of these areas in terms of social infrastructures. An acceptable 60% of potential hydropower utilization in Nigeria will increase the power generation to around 12 GW, a figure that will make electric power stable in Nigeria and increase industrial activities in the country (Manohar & Adeyanju, 2009). In assessing the hydropower potential of the Kampe (Omi) river dam in Nigeria, Salami et al. (2010) developed an optimization model with the maximization of energy generation as the objective function, while the demand for irrigation, water supply, and ecological releases were considered as constraints. The model was solved with LINGO software for different mean annual inflow exceedance probabilities. Three options by which the hydropower plant could be retrofitted were considered, with the annual hydropower energy obtained for each option at different probabilities of exceedance. In the report, it was recommended that the live storage should be raised to 240 Mm3 by taking 20 Mm3 out of the flood storage space. This would increase the maximum monthly draft and hydropower generation potential of the Kampe multipurpose dam. In addition, Bilewu et al. (2009) assessed the possibility of retrofitting hydropower generation into the Asa water supply dam, Ilorin, Nigeria. The hydropower potential of the dam was evaluated using the sequent peak analysis to determine the storage–yield relationship of the reservoir, thereby ascertaining the available flow for power generation. In forecasting the monthly reservoir inflow, the Thomas–Fierring of first-order Markov model was used, and the synthetic monthly flow series was calculated using observed historical monthly stream flow sequences. The amount of hydropower potential available at the dam was estimated as 2.25 MW. The retrofitting of hydropower plants in existing dams, such as the Doma dam, could represent one way of solving local power needs, as water resources are renewable and allow the possibility of producing clean, cheap energy. However, it is essential to objectively evaluate the system potential and identify the best form of operation to avoid the conflicts that may arise when the available resources cannot meet the demands of all the users in a system. For the reasons discussed above, this study has selected the Doma reservoir in Nasarawa state, Nigeria, with the intent of evaluating the reservoir yield and its hydropower potential under its existing uses. The Doma dam is a multipurpose dam constructed off the Ohina River, a tributary of the Mada River in the Lower Benue Basin in north central region of Nigeria. It lies between a latitude of 8°19'42"N and a longitude of 8°18'59"E. The dam is under the jurisdiction of the Lower Benue River Basin Development Authority (LBRBDA). The primary purpose of the dam is to provide water for the irrigation of agricultural crops and the water supply. The dam provides a natural habitat for various aquatic lives, including fishes of many species. The dam was built in 1986, but at the time of this study (2015), it has not been put to full use. The Doma dam has a capacity of 37.5 Mm3 and can irrigate 1,000 ha of land, but only 250 ha of land is presently under irrigation. About 10 Mm3 of water annually is extracted from the dam and treated for the supply to the Doma community. The dam structure is an earth-filled dam with an altitude of 132 m above mean sea level, and it has a foundation at 105 m above sea level. The width at the foundation is 160 m, and at the crest, it is 18 m (Bawala, 2003; Yaro & Ebuga, 2013). One of the most important hydrological variables in planning and design for hydropower generation is flow in the river of interest or the inflow to the reservoir where a dam exists. Gupta and Jethoo (2014) revealed that the water inflow in dams may not reach the expected inflow; hence, there is need for proper planning and management of available water. Salami et al. (2014) revealed downward trends exhibited by the runoff and water level in the Benue River sub-basin in Nigeria, which may stem from the effect of climate variability on hydrological variables. The reduction of runoff is an indication of the decrease in water resources in the sub-basin, and it can result in a low reservoir inflow to hydropower dams in the sub-basin. In the planning and management of the reservoir inflow, the record of average monthly inflows at the Doma dam, which is available for only 17 years (1990–2006), was collected. The data were extended to 2025 by modeling the inflow using ALYUDA forecaster XL. ALYUDA Forecaster is a Microsoft Excel forecasting add-in based on artificial neural networks (ANNs). The general concept of ANNs in reservoir inflow forecasting is that such networks can map the relationships between various factors affecting the inflow and the actual inflow. The network performance was evaluated on a test dataset, which was not used in the training process. The ANN model was trained with the first 14 years of inflow data (1990–2003), while the inflow data from the remaining 3 years (2004–2006) were used for the model testing and validation. where the final reservoir storage volume is denoted as St+1, the initial reservoir storage volume is St, the known inflow is Qt, the unknown yield is Y, and Rt is the release, if any, in period t.
The water for power variable was determined using the sequent-peak algorithm to estimate the storage needed to meet the primary purposes of the dam, including ecological releases and evaporation losses. The data for the various components of water uses considered in the algorithm are presented in Table 1 (Salami et al., 2017). This method is expected to give a reasonable idea of the available flow for power generation than the flow duration curve method, which is more suitable for an unregulated flow situation. Sequent-peak analysis is more appropriate for examining the feasibility, including power, at a multipurpose reservoir (Macaringue, 2009). The analysis assumes that the time interval includes the critical period, which is the time over which the flows have reached a minimum, causing the greater drawdown of the reservoir. The other assumption is that the total release over the time interval of analysis does not exceed the total reservoir inflow (Mays & Tung, 1992). To implement the equation, the reservoir is assumed to be initially full, that is, K0 = 0.
where Q is the discharge (m3/s), H is the net head (m), e is the overall plant efficiency, ? is the density of water (Kg/m3), and g is the acceleration due to gravity (m/s2). The performance reports of the ANN model generated and presented in Figure 1 show the relationship between the ANN-forecasted and actual reservoir inflow for the reservoir. 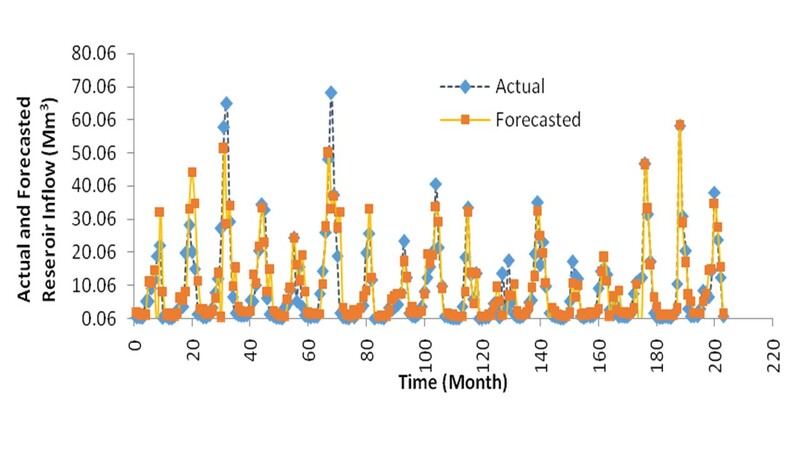 Figure 2 shows the scatter plots of the forecasted and actual runoff, while Figure 3 depicts the error deviation of the forecasting. The ANN model generated a positive relationship between the observed and modeled reservoir inflows, with a correlation coefficient (r) value of 0.85 and coefficient of determination (R2) value of 0.71. The comparison between the ANN forecasted and actual reservoir inflow data that were not used in training showed that the forecasts were closer to the observed reservoir inflow, with a maximum error of 2.8%. This showed that the network produced a good fit and can be used for subsequent prediction of reservoir inflow. The storage yield function for the Doma dam is presented in Table 3. The maximum monthly draft that can be withdrawn from the reservoir with a live storage of 30 Mm3 was found to be 6.56 Mm3. The corresponding value of possible total releases for live storages of 25 Mm3 and 35 Mm3 were determined to be about 5.73 Mm3 and 7.40 Mm3, respectively. The extra storage can be taken from the flood storage zone of the reservoir (when there is no tendency for the occurrence of flood) for hydropower generation. Therefore, with 50%, 75%, and 100% of the available excess water in storage, between 0.5 MW and 1.0 MW of electricity can be generated. The initial cost of the potential power project is about US$1,750/kW (INFORSE, 2012); multiplied by 500 kW, this gives US$875,000 for a 0.5-MW plant to US$1,750,000 for a 1.0-MW plant. If the plant works for 12 hours a day, it will generate between 2.160 and 4.32 GWh yearly. Presently, in Nigeria, electricity consumers pay 4 cents (N13.00) per kWh. This translates to US$175,500–351,000 annually. Hence, it will be possible to recuperate any investment in this project in 5–7 years. The approach presented in this paper can be used for other reservoirs by following the steps presented in subsections 2.1 to 2.4. In the hydrological context, this study assessed the technical viability of incorporating a hydropower scheme at the Doma dam. It was ascertained that the hydropower potential of the dam was 0.5–1.0 MW, depending on the percentage of the excess stored water assigned for power. A Kaplan turbine was selected based on the 20-m head and 6.53 m3/s discharge parameters. The total capital cost for the proposed project is estimated to be US$875,000–1,750,000, depending on the turbine capacity selected. The project is expected to deliver 2.16–4.32 GWh of energy per year. Thus, the study has established that the Doma dam has other potential uses beyond irrigation and water supply. It is hoped that the hydropower generated would enhance the quality of life of the people, as it could lead to poverty reduction, job creation, and the establishment of small-scale industries in the community. The authors would like to thank the management of the Doma dam, Lower Benue River Basin Development Authority, Makurdi, Nigeria, for providing the data used in this study. The authors would also like to thank the Department of Civil Engineering, National Centre for Hydropower Research & Development (NACHRED) and Department of Water Resources & Environmental Engineering, University of Ilorin, for providing technical support. International Network for Sustainable Energy(INFORSE), 2012. Sustainable Energy News No. 75.